Chicken and veal versions (Milanesa de Pollo and Milanesa de Ternera). 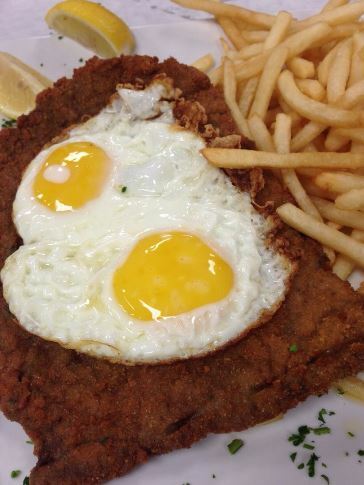 Milanesa is typically served with a side of french fries and a wedge of lemon. Lightly pound the meat with a mallet to tenderize it. Beat the eggs in a medium sized bowl, beat in the parsley, salt and pepper. Place the breadcrumbs in a shallow dish. Dip the cutlets, one at a time, into the egg and spice mixture, and then place in the breadcrumbs. Press gently on each side to ensure that the cutlets are evenly coated all over. Place the breaded cutlets on a plate and place in the refrigerator for several hours or overnight. This will give the best flavor, but if you are hungry and rushed, they can be fried immediately. Heat a half-inch oil in a skillet over medium-high heat until very hot. Place the cutlets in the oil, two at a time, and cook until browned on one side, 5 to 7 minutes. Turn the cutlets and fry on the other side until browned, about 5 minutes. Remove to a paper-towel lined plate and repeat with the two remaining cutlets. Serve with french fries or Ensalada Rusa and a wedge of lemon. Next ProjectGreek Moussaka! .😋 Mousaka Griega!